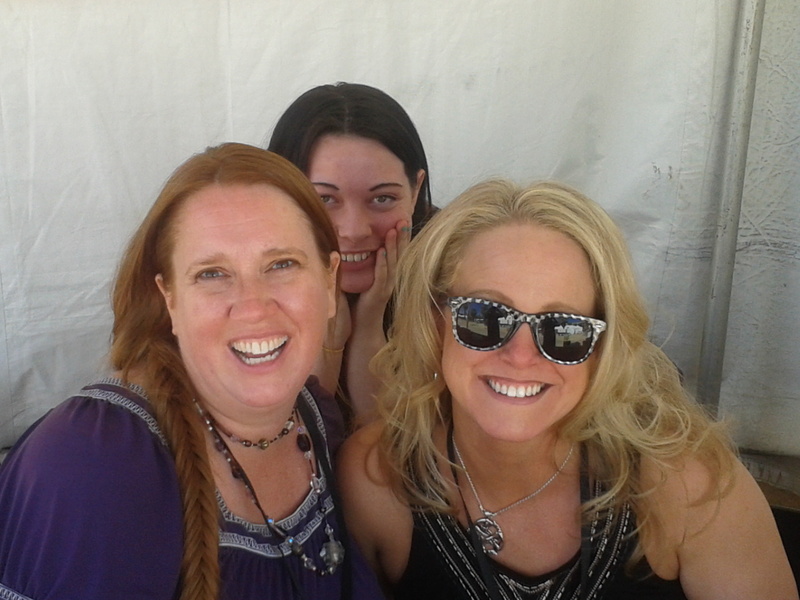 This weekend was the Tucson Festival of Books, or TFOB for us locals, and I was in bliss. Not only did I get to hang out with my wonderful RWA group, but I hung out with/ babysat Kristen Lamb and Piper Bayard, both as lovely and amazing in person as they are in the web. I love it when I get to meet spider friends! I threatened my way into . . . um . 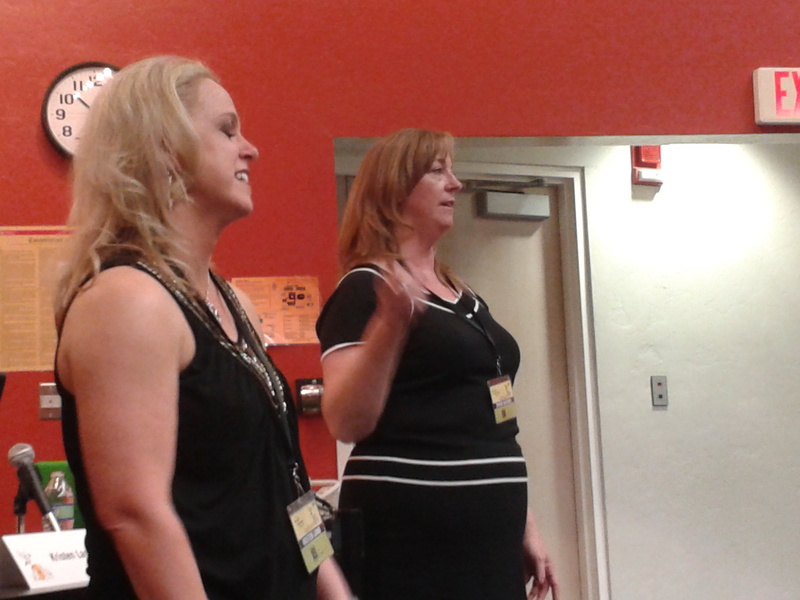 . . asked to moderate all of their talks at the festival, so they couldn’t escape me . . . to support and help them. I had help because Piper brought her lovely elfin daughter to help her. So when I had to go to the bathroom, someone else was there to keep an eye on them. Note for future: when Kristen’s fingers are shaking, it means she didn’t eat breakfast; must bring gluten-free, dairy-free snacks next time, because those Snickers commercials are based on her. Kristen was so entertaining that during her first social media talk a man who is not an author bought her book just to learn more, once I promised him that the book was written just like she talks. I learned so much about spies from Piper’s talk that I shall now yell in frustration during spy movies, except for RED because Helen Mirren’s awesomeness fixes everything. I’m also going to polish up my assignation technique. 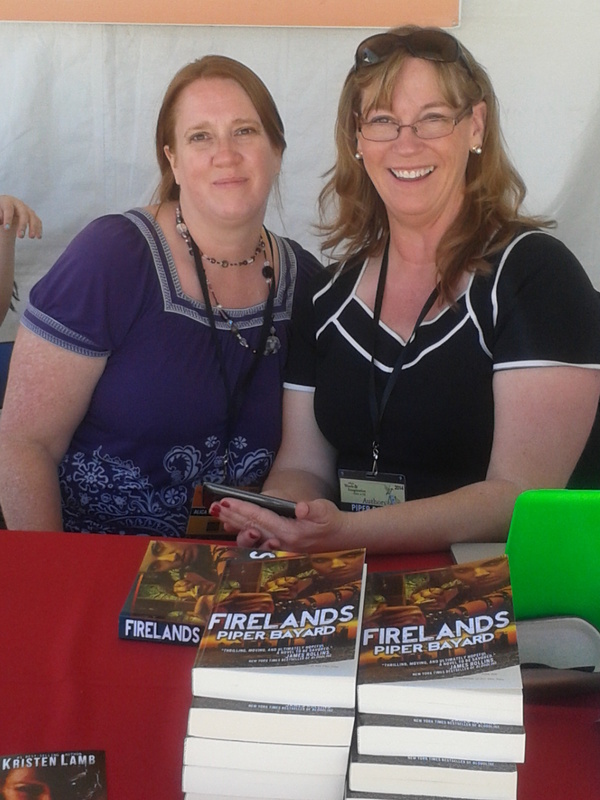 Piper and me during a lull in her book signing of Firelands. The two different social media talks that Kristen and Piper gave together were so funny and empowering. It was awesome to watch the crowd go from scared quivering writers, terrified of Twitter, to ready to take on blogging and set up webpages! Piper says, “I have to disagree with Kristen on this one.” Kristen is not amused LOL! I did fear for my life a few times as the crowd rushed towards Kristen and Piper to get books, ask questions, and thank them for sharing their wisdom. But fear lets you know you’re still alive. And as if hanging out with those three wasn’t amazing enough I was surrounded by writers all weekend! People who understand that you might have to stop and write down your new historical/horror/monster love/memoir because the way that man just took a bite of his hot dog made you have this massive epiphany about how your hero will court your heroine. Of course you need to write down your brilliance. I’ll hold your purse, get that epic idea down before … squirrel! There were also readers there; readers who don’t actually know that as a writer I spend most of my time in yoga pants and old tee shirts staring at the word ‘the’ because I’m not sure if I spelled it right. Readers who are impressed and in awe of those of us who have so many voices shouting in our heads that we have to write or face spending our days wrapped in a strait jacket. Now it is over, and I had to say good-bye to Piper, her daughter, and Kristen. And while I feel inspired to write more, blog more, and re-commit myself to my author journey, I am sad that I won’t see them tomorrow and my haven filled with other people crazy and creative enough to be writers is gone, until next year. 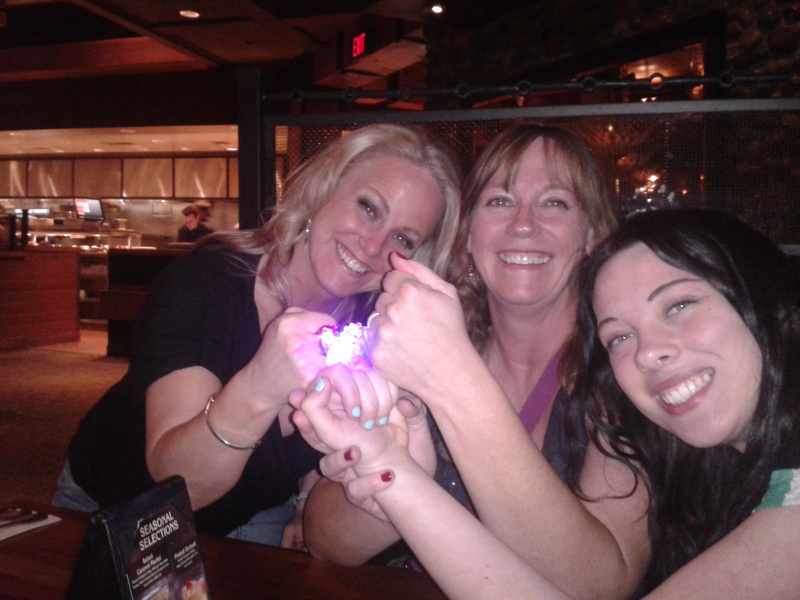 Of course I always have my wonderful spider writer friends online to help keep me sane-ish. A hungry Kristen tries to hot-wire a cart to go in search of food. Tell me about your favorite conference, one day my kids might move out and I could have money to go to it too! Piper’s daughter did my braid isn’t it wonderful! I can but not on myself. Alica, it was a pleasure acting as sometime timekeeper and bouncer. 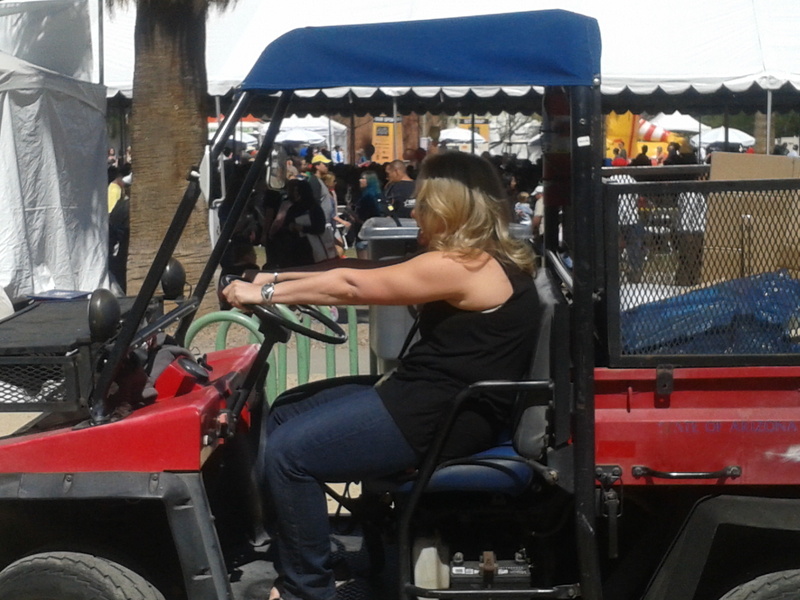 Kristen hotwiring the cart, hardly a surprise, LOL! Piper’s daughter is great and highly intelligent. Kristen and Piper would make a great detective pair (I think, but I might be wrong). Ah, but for those three, which order are they in on the FBI’s Ten Most Wanted? 😛 Ah but tis a pleasure. Thanks for your help Mike, and there is a weird clicking noise on my phone after hanging out with those two all weekend. I am not surprised, Alica, lol! Love it! Looks like you had a blast! I agree that your braid was gorgeous! I want DD to do my hair! Looks like you had a blast! I was only able to go to one talk on Sunday, but it was a good one. I had an amazing time. Who did you get to see talk? *hugs* you are so sweet, and meeting you was amazing! I can’t wait to hang out again. Yes, you must, its a wonderful festival and all of these wonderful author panels are free!! I thought *I* was the only writer that occasionally wonders whether I have spelled “the” correctly! And yes, Hellen Mirren’s awesomeness is completely epic.